"I bought tahini to make hummus. I had a lot left over, so I decided to make a yummy cookie with them. They passed the husband taste test, so I thought I would share with all." Mix flour, baking soda, and salt together in a bowl. Beat butter, brown sugar, white sugar, tahini, honey, and ground cinnamon together in a separate large bowl with an electric mixer until smooth and creamy. Add eggs; mix well. Beat flour mixture in gradually until dough is just combined. Stir in coconut, oats, and almonds. Drop spoonfuls of dough 2 inches apart onto ungreased baking sheets. Bake in preheated oven until edges are golden, 9 to 11minutes. Cool on baking sheet for 1 minute before removing to a wire rack to cool completely. 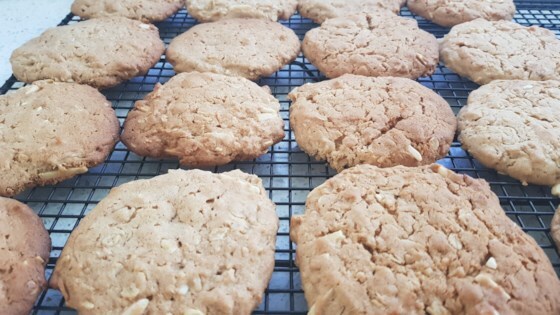 See a top-rated recipe for soft, chewy oatmeal cookies. What a different and delicious twist on an oatmeal cookie! The cookies are very good, my family loved them. The tahini gives them a nice, smooth consistency. They're a little bland for my taste, I will add some almond extract next time I make them.